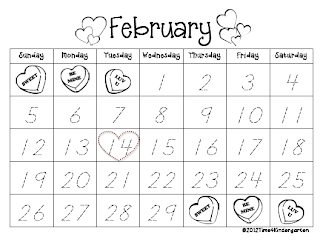 Here is the calendar for February. It feels like we just made the January calendar. This is great! I am going to use it for morning work! Thanks for sharing! Thanks for sharing this...great for morning work! Click on over and check out my new blog! Where do you get the graphics for the numerals that are dashed, like those featured on your calendar? I want to purchase them. I can't find any font that features a 4 that is like the one our students use.